I’m ready to run a marathon! Well maybe one day I will be ready – Straight from NY to Paradise in a Day!!! 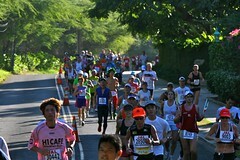 Yesterday was the Honolulu marathon. Did I run? Nope. Things I know about myself: long distance running is not for me, and I would not be too happy with marathon blisters on my feet. However, with all the pre marathon excitement and anticipation I almost had a small inkling of a desire to actually go for a 26.2 mile run. But yeah, that just did not happen. When I was living in New York every first Sunday of November, I would watch the New York City marathon on television and always think to myself, next year I am going to run in that marathon. It looks fun rather from afar. All the people, the crowds cheering, running through the city borough by borough. I would say to myself “oh what fun, I can’t wait to do that next year”. Then the following day would come, and of course I would forget all about it. 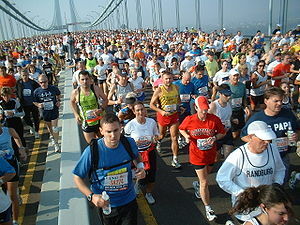 When I lived in New York I wasn’t really a runner. It was cold outside for half the year, so I wouldn’t dare run outside, and getting on a treadmill excessively was a bore after a while. So needless to say, running was not a high priority activity for me. Running an entire 26.2 in one day would be something that I would continue to only dream about. Since I have been in Honolulu I have been running on a more consistent basis. Honestly, I have no excuse not to run. The weather is perfect, there are plenty of areas to go running, and everyone is doing it (as they say when in Rome, do as the Romans do). I have become actually pretty good at running, not great, but a far better runner than my New York self. I can run miles now, and when I completed the Great Aloha Run, I realized that I could actually run 8 full miles. Now if only I could add on 18.2 miles to that then I would be prepared to complete a marathon. It amazes me that I am 29 and finally in the best athletic shape of my life, I wonder where all this energy to stay in shape was when I was 16. But oh well, better now than never. My hope is to be in even better shape at 30, and maybe next year the thought of doing a marathon in either New York or Honolulu can go from being a distant pipe dream to an actual reality! And why not, I already know that I have some athletic capability. If I keep going I will be able to have the endurance to go longer, stronger, harder, faster, and suddenly hit that 26.2 mile wall, which I must say will make my inner 16-year-old self very proud. I am not the best runner. I get bored with running. I never get that runner’s high that so many people talk about. When I run I don’t stop because I am tired, or my legs are giving out, I stop because my mind has taken over and hit the territory of boredom. How do I get over that? I know running is mostly mental, I need to keep my mind on track so I can go for that long distance run. Any good ideas on how to get to the land of runner’s high so I could just zone out and run? If you find out how to get to the ‘runner’s high’, I’d love to know. I’ve run and realized that 3-4 miles have passed since I last thought about it, but that’s about it. I do, however, get an ‘after the run’ high. That keeps me coming back for more! I will definitely share the information if I ever find that runner’s high. I hit a 4-5 mile wall and then its over. I agree that high that makes you keep going back for more is awesome, I am glad that I at least found that.